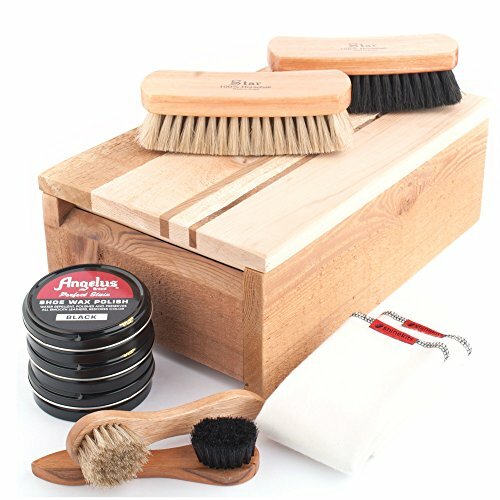 Our Pinstriped Cedar Fence Board Box is a more rough hewn version of our previous kits. We've built these solidly from cedar fence boards and they're still quite aromatic after a light sanding on the board stock. The lid features a unique design of light and dark strips of red cedar creating a pinstriped look. Keep all the tools for the job close at hand in a beautiful box crafted from Vancouver Island grown Red Cedar. This is something you'll want your own kids to have one day. Angelus Shoe Wax still uses the original formula created in 1907. A blend of pure carnauba wax, beeswax and the finest grades of other waxes and essential oils. We tested a lot of polishes and this stuff is the best. Horsehair gets the job done right. The fibers clean and polish the leather. Our brushes are 100% Brazilian horsehair and hardwood. The finishing touch. Our own handmade shoe shine cloths. High quality flannel reinforced with distinctive black stitching. The final step to make that favorite pair of shoes look like new again. These boxes are proudly made in the United States in Lake Oswego, Oregon.